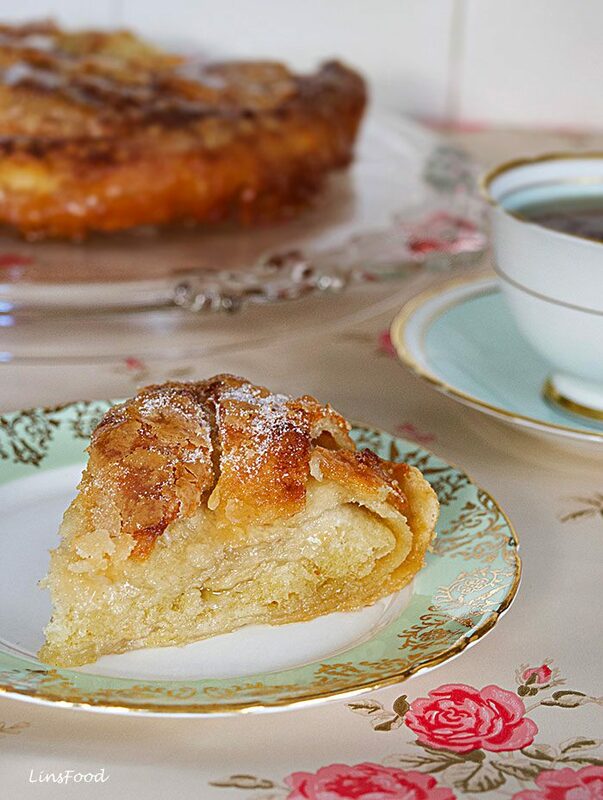 Kouign Amann in a buttery, layered pastry cake from Brittany, France. Scroll down for the YouTube video tutorial. A freshly baked kouign amann, that Breton butter gateâu, is sheer bliss. Hot, caramelised layers of pastry, practically drenched in Brittany butter with salt crystals and sugar, oh boy, lots of sugar! And how do you eat it? With a side sprinkle of sugar! Sound like heaven? Believe me, nirvana has nothing on a hot slice of kouign amann! 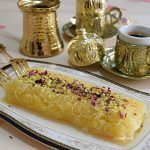 As you take a bite, you sink into layer after layer of soft and crispy, sweet and buttery pastry with touches of salt demanding attention. Welsh equivalent is the etymologically identical cacan menyn, literally ‘cake (of) butter’. I remember my very first bite of kouign amann, over 2 decades ago. I was visiting some friends in Brittany, who lived in Camaret-sur-Mer, a little sea town (or commune, to be precise) in northwest France. That was one of my first few visits to France and I loved every minute of it! There were so many new things to eat and drink! But what I really, really fell in love with, was the local butter cake called Kouign Amann. And although you could easily buy them from the local bakeries, my hosts always made their own. For 3 straight days, I observed maman making kouign amann in her Breton kitchen. The first time around, I must confess, I got nothing! She was just too fast, with her hands and her spoken French! She slowed everything down slightly for me on the second day, while her daughter, Cecelia, translated. Not too slow, we were, after all, working with pastry. But that was much better. And as we sat down to enjoy it at tea time, I wrote the recipe down. In English! On the 3rd day, I observed again, and everything just made so much more sense. And on the 4th, I made it, while maman watched and barked out instructions. The result? A pretty good kouign amann, not as light as my tutor’s, but pretty good, if I may say so myself. I have my granny to thank me for that – pastry, cakes and I have always been old friends! Over the years, I’ve made this layered Breton butter cake a number of times, and everybody at home loves it. What’s not too love, after all. And an added advantage is that it’s eggless, my girls, who have an egg allergy, can enjoy it to their heart’s content as well. It is actually a pretty easy recipe to put together, don’t believe everything you read! To a certain extent it is like puff pastry, butter in pastry, fold, roll, fold, roll, and so on. 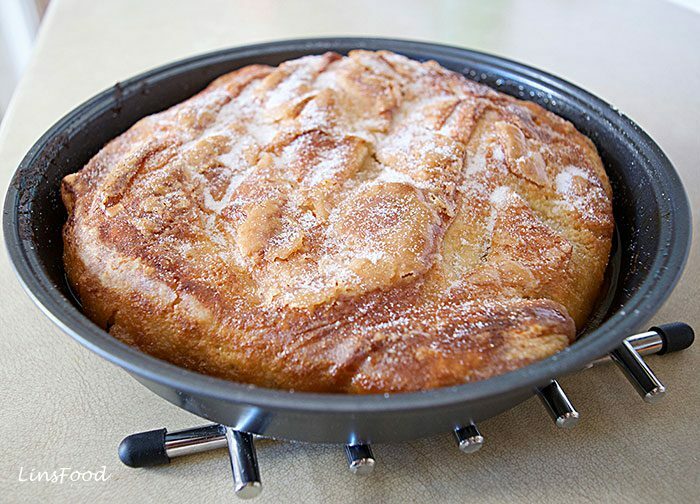 In Brittany, Kouign Amann is always made as a round cake in a cake pan, to be sliced and served. And also not uncommon, is to roll the pastry up into a long sausage like roll, slice off little “sausage rolls”, then tuck them into the cake pan on their sides, resembling pastry roses. 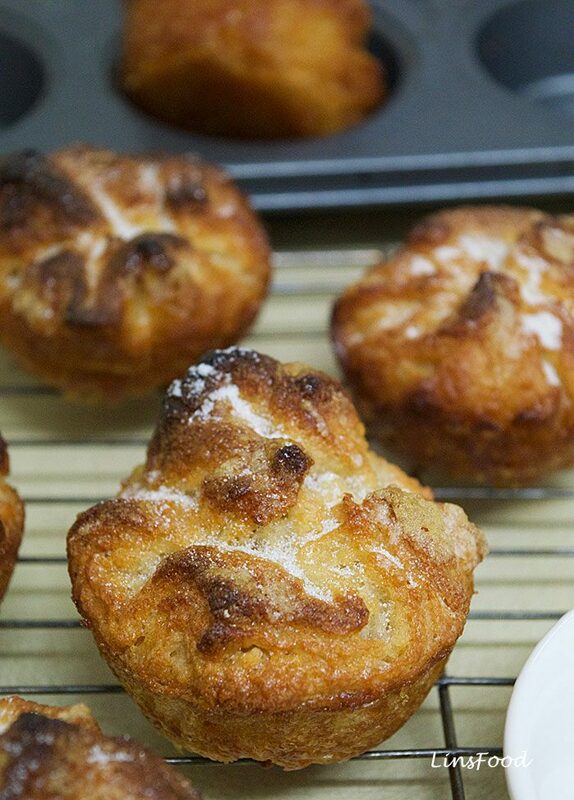 The whole muffin sized kouign amann are a recent invention, whether here in the UK or in the US, I couldn’t tell you, although I remember reading somewhere that David Lebovitz made them for his book L’Appart. This much loved Breton cake was also a challenge in The Great British Bake Off, some years ago. I don’t watch cookery shows, so can’t really comment on that one! David says that it’s a very sticky dough, but in all my experience of seeing kouign amann being made by Bretons, I have yet to come across a very sticky dough. 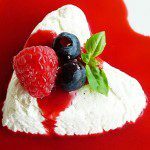 Many recipes on the web share another common theme: there is a whole lot of pastry resting going on! I see the pastry being rested so much, just like puff pastry, it’s mind boggling! The only “resting” I do, is the initial rise of of 1 and a half hours. The recipe I’m sharing with you is the one I learnt over 20 years ago in a kitchen in Brittany. Have I made any changes? Just in the amount of butter and sugar used – I’ve cut it down by 50g (1 1/2 oz). There was always too much fat in the pan after baking, I also didn’t think it needed that much sugar. Can Kouign Amann be Made Ahead? Many people will tell you no, that it has to be eaten fresh, and preferably, while it’s still warm or hot. However, in my experience, it is perfectly fine kept in an airtight container for about 3 days. Then, warmed up slightly before eating. Ideally, pastry should be warmed up in a convection oven, but, when it’s already half eaten, or just a small piece? I zap it in the microwave oven for 20-30 seconds a slice. Then sprinkle with a touch more sugar, if you like, before serving. This is no diet food, so leave those calorie and fat counters at the door! This is a Breton recipe, so butter from Brittany is best, if you can get it. The sort that has tiny salt crystals. There is something so pleasurable about eating a sweet while getting hints of salt. Like salted caramel. You don’t like salted caramel? Mon Dieu! I remember having a chat years ago with a friend who was a pastry chef. 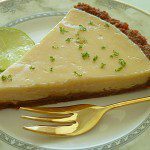 He would argue with me on the use of butter with salt crystals, saying that the salt would puncture the pastry. But I’ve never had the problem. The trick, I assume is to be gentle when rolling the pastry, after all, you don’t want the butter escaping either, if you can hep it. Some French chefs and cooks I know, soften the butter and just spread it all over, instead of using a flattened, cold slab, as we will be doing. The yeast is what changes this Breton wonder from a pastry to a gâteau. The amount of yeast used is very, very instrumental in the final texture of your cake. I’ve known people who only used a pinch of yeast to the amount of flour here. 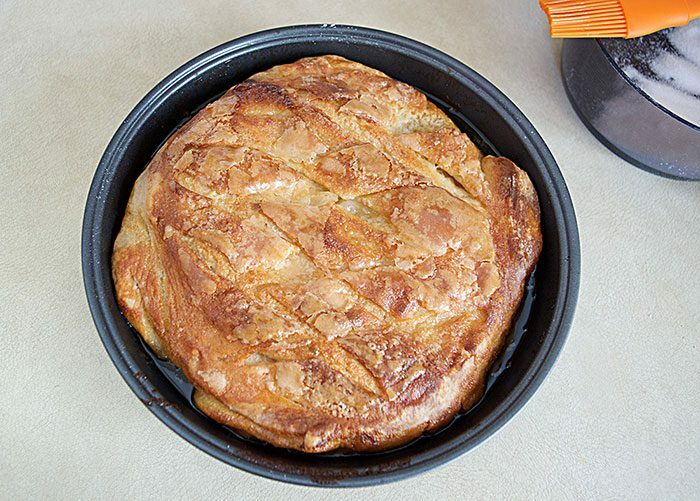 The more yeast you use, the more bread/cake like your kouign amann is going to be in texture. The less you use, the flatter and denser it will be, and also crispier. The amount we use here gives you something in the middle. Not quite bread like but still a trace of sponge like texture, along with crispy layers. It’s something you can play with when you get the time and inclination! I still change it around, after all these years, although my favourite, is definitely with the amount in this recipe. Shall we get our aprons on? How to make Kouign Amann, Brittany's butter pastry cake. Hot, caramelised layers of buttery and sugary pastry. 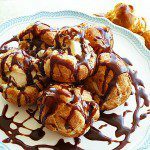 La recette du Kouign Amann - le gâteau au beurre de Bretagne. Dissolve the yeast in 125ml (1/2 cup) water. If using fresh yeast, go straight on to step 2. If using dry yeast, leave it in a warm place for 10-15 minutes until it's foamy/bubbly. Place the flour either in a bowl or directly on your work surface and create a little well in the middle. Pour the yeast mixture in, and, using your fingers, mix it all up to form a rough dough. Knead the dough for a good 5 minutes until it's all stretchy and smooth. Place in a lightly greased bowl and cover with a cling film or tea towel and leave in a warm place to rise for 1 1/2 hours until practically double in size. In the meantime, get the butter out and place it on a large sheet of baking paper. Fold the baking paper over in half, completely covering the butter (see video). With a rolling pin, beat down on the butter to flatten. This is actually much easier than you think. Roll it slightly to help it to flatten into a rectangle roughly about 23cm (9") x 15cm (6"), give or take. An inch either way doesn't really matter. Place the rectangular disc of butter back in the fridge until needed. Grease the cake pan and line with baking paper. Grease the baking paper. Preheat the oven to 180˚ (350˚F/16˚C Fan). When the dough has had its 1 1/2 hours, tip it onto a lightly floured surface. Flatten the dough, sprinkle some flour over it and start rolling it out into a rectangle measuring about 28cm (11") x 20cm (8"). Essentially, we want rolled out dough that's about 5cm (2") wider than the butter, all around. Now get the butter out of the fridge, and still in the baking paper, place it on the dough to see if the dough is big enough with 5cm (2") extra all around. If not, roll out the roll a little bit more. Working quickly, especially if you have warm hands (mine are always cold! ), take the wrapping paper off the butter and place the butter centrally on the dough. Sprinkle most of the sugar on the butter slab, leaving about 2 Tbsp aside. Now fold the edges of the dough over the butter, overlapping the dough. You will have to stretch the dough to make it overlap. That will be easy to do, as it's a stretchy dough. Now we are going to fold and roll out the dough 3 times. Roll the dough out to form a rectangle. Then fold the top third of the dough down, and fold the bottom third over the top you've just folded down. Take a look at the video, and this will be clear. Then you need to fold it in the same way in the other direction too (see the video). If it's not long enough to fold, just pat it down hard or roll EVER SO SLIGHTLY to make it a little longer. Now, you've done 1 fold. Repeat this step (roll into a rectangle, fold, fold) 2 more times. You can do it a 4th time if you fancy. After the 3rd fold, roll out the dough gently, to form a round shape as much as possible. Don't worry too much about it being a perfect round, you can fit it into the cake pan. Fit the dough into the cake pan. Brush the milk all over the top of the unbaked kouign amann. Using a bread lame or a scoring tool (blade), score some shallow cuts all over the kouign amann. Sprinkle half the remaining sugar all over the kouign amann dab the extra butter all over, and bake in the oven for 30 minutes. When done, sprinkle with a little more sugar, let it cool slightly, cut into slices and serve. 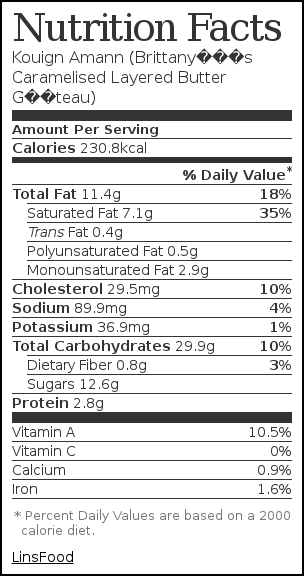 Nutrition is based on 12 servings. I am curious as to the reasons why you do not recommend using instant yeast. Hi Mark, although instant yeast can be used as a substitute for dried active yeast, it does work faster. In this instance, I didn’t want to confuse the issue, and start giving times to accommodate the 15 minutes or so, given that kouign amann has a reputation for being difficult. That shorter active time and therefore, extra rise, will change the texture of this cake into a more bread like one. I hope that makes sense. Not all my yeast using recipes make that distinction. Thanks for the recipe and the video. Your Kouign Amann looks amazing. I’ll try making one today. Just wonder that do I need the last proof before baking it just like other breads do? I don’t bother, as that’s how I learnt it. I think that if you leave it to rise that one final time, the cake will definitely turn out less crispy. I just made this tonight and it turned out amazing!! I baked mine in a cast iron skillet and turned out incredible. My fiance was very impressed. Thanks so much for the recipe, so glad I came across your website!! I will be making this more and more in the future. I believe I have had this pastry in Montreal. I remember it was so buttery and sugary, really delicious! 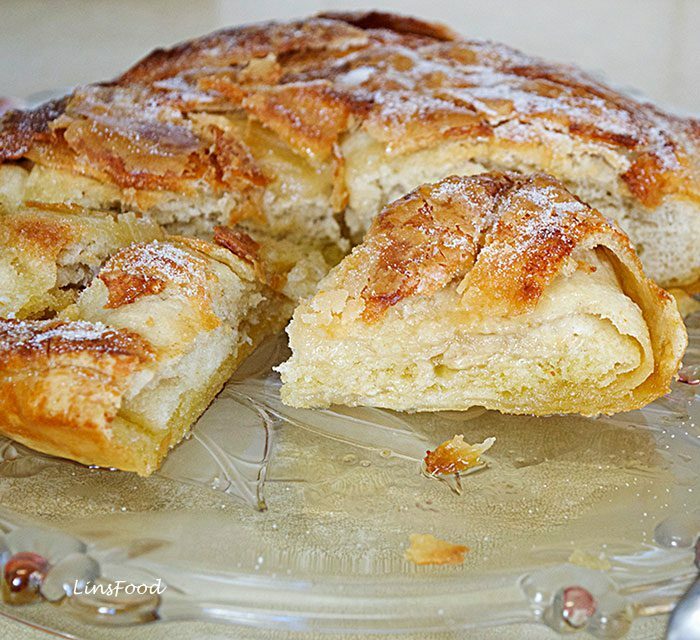 Your kouign-amann looks fantastic, Azlin! I can see what you mean by a combination of soft and crispy layers. I am looking forward to making this. Thank you Jean, let me know how it goes. Thank you for this recipe. You make it look very easy. I remember watching this on the Bake Off and they made it look really hard. I just watched your video and I think I can do it. I’m going to try and make it this weekend. 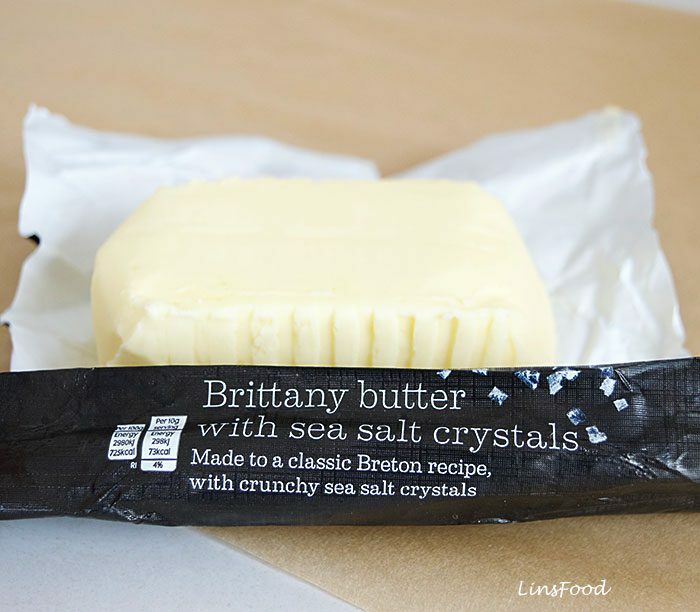 If i can’t get the butter with the salt crystals, should I sprinkle some salt on? Hi Mary, that’s what I do, just literally a pinch of salt sprinkled on the butter slab, followed by the sugar. But if you’re not bothered, you can skip that and just use salted butter. Wow, this is just amazing! I can get these in muffin sizes at a local bakery. I didn’t even know that they are made in cake sizes traditionally. Thank you, a great write up! Thank you, Tony. You are lucky to be able to get them from “around the corner”!